10 days into the new year, many of us already have a 5 star book for 2012. 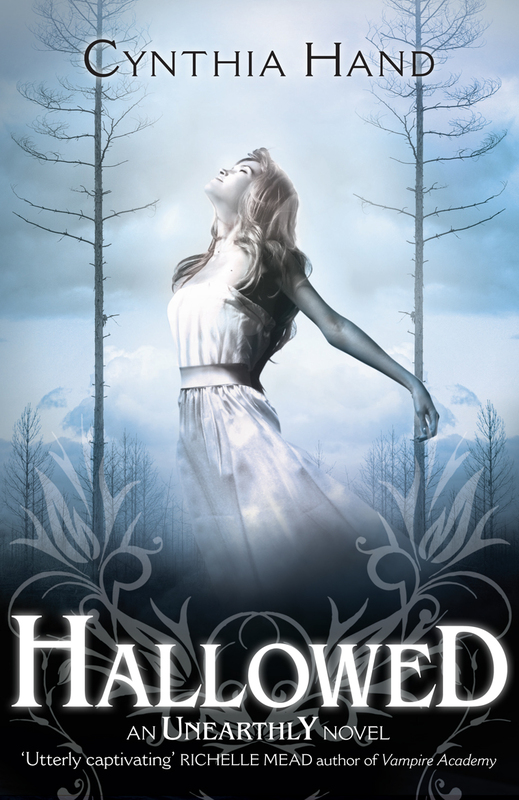 Hallowed is the moving sequel to last year’s Unearthly, and like many other early readers, I was completely swept away by the intensely emotional second chapter to Clara’s story. Author Cynthia Hand chats with us below about the new book, which releases one week from today on January 17th! There was a lot of near-hysterical excitement over this post, so I hope it’ll leave you wriggling in your seat the way it did me. Don’t worry, this interview is mostly spoiler-free, so it’s safe even if you haven’t read the book yet. And don’t forget to join us tomorrow for the second part of this interview, too. Firstly: are you trying to kill us with this emotional roller coaster? Lol, not trying to kill you, I swear, although my editor and I joked that our goal for this book was to make people sob their eyes out. I bawled like a baby when I was writing one of the scenes in this book, I was writing in the Pepperdine University library, and I was like 6 months pregnant at the time, too, so people thought something must be seriously wrong with me. I had loads of fun writing more with Tucker, just watching the way he and Clara were together as a more settled couple. And I enjoyed getting to know Christian better, too. Well, you succeeded; we sobbed our eyes out. **Slightly spoilery, so don’t read this question if you haven’t read Hallowed yet. ** One of the most touching elements of Hallowed is this theme of loss that seems to run through it. Did you draw upon your own experiences for this? There are moments in this book that feel extremely personal. Yes. (Did I mention the crying I did at the Pepperdine library?) This book was intensely personal for me. I really wanted to capture how it felt to lose someone you love, the whole process of it, the event of the death itself, the preparation, the food, the clothes, the ceremony of it all, the finality, the grief. It’s not something I’ve seen done in a lot of fiction, particularly YA. Clara grows up in a big way in this book, particularly in taking control of her future. When you outlined your series, did you also plot her emotional arc and personal growth? Do they parallel the events in the story in some way? Not really. I like to set my characters in certain situations and then try to follow them. There’s a magical element of surprise in writing that way, which I love. I’ve got to watch Clara grow up only a few steps before my reader does. Jeffrey is still something of a mystery. Will we learn more about his purpose anytime soon? What can you tell us about Samjeeza? There seem to be signs that he’s more complex than we’d originally imagined. I have an entire novel plotted around Maggie’s life. I dearly hope that I will get to write it someday, and Samjeeza is a major part of that book. I find him to be an incredibly complex and fun character to write. What kind of research did you do into angelology? It’s very clear you have a quite a breadth of knowledge in this area. I did a lot of research, read tons of books and articles, and watched some crazy specials on the history channel. There’s some fascinating angel mythology out there, not only for the Christian religions, but Jewish and Islamic angel myths, as well. I wanted to be an expert on the subject (I’m still pretty far away from being an expert, truthfully) but I also wanted the leeway to create my own mythology, so I grabbed bits and pieces I liked out my research and made up the rest. You can see touchstones of all kinds of influences in the books, though, if you look hard enough. There’s a lot of C.S. Lewis there, in the way heaven and hell are portrayed, in the ideas of predestination and free will and time. I was always influenced by the philosophy of Eckhart Tolle, who takes a very different view of things than Lewis. There’s also some Dante and Milton and a whole lot of angel characters lifted from The Book of Enoch, (Samjeeza, for instance) which is kind of the go-to book about angels. I find the B of E fascinating, but I didn’t want to lean too heavily on it or work with the assumption that it was true, because that would be pretty limiting. That’s my general rule about research: do a lot of it, and then don’t be afraid to toss it out and make up something new. I try not to take myself too seriously, research-wise. A number of readers are curious how free will and predestination come into play in your books. Could you clarify what the different kinds of angels can and cannot do? Are they subject to a pre-destined fate? I don’t think it would be fair for Clara to get black-and-white answers if we, as humans, don’t get any. But I love to talk about it. All the stuff in Unearthly came from my own questions: do I have a destiny? If I do have a destiny, is it possible to screw it up? If I screw it up, do I get a new destiny, or, because it’s destiny, after all, do the powers that be already know I was going to screw up so I am still with the original destiny? Are our lives planned out for us, or do we have choices? Predestiny or free will? I could not get these two concepts to work together in my head. My goal with the Unearthly series is not to solve this dilemma or attempt to answer those questions, because that would be pretty, um, arrogant. But I really wanted to explore the questions. That said, I worked it out in my angel-universe like this (and please note that this is fiction, and there are holes, of course, and it is not even attempting to touch theology): Angels, in my world, do not truly have free will. They were designed to obey God, and when they disobey, it causes them a lot of mental, emotional, and even physical pain. This is a real inconvenience for the Black Wings, and why they feel this debilitating sorrow all the time. They can’t do what they want to do, a lot of the time, because it causes them too much pain. Humans, on the other hand, have free will. Angel-bloods, in any concentration, Dimidius, Quartarius, Triplare, whatever, have free will because they are part human. They can willfully choose to disobey God. It might cause them some pain too, but nothing to the degree that a full-blooded angel would feel it. That’s why angel-bloods are attractive recruits to Black Wings. They can use angel-bloods to do things that the Black Wings would themselves find too painful to carry out. And part of why the Black Wings are so staunch in their resistance. They are, in their own way, demanding free will. They will make their own choices, no matter how much it hurts. Now. How then, if Clara has free will, can she also have a purpose, a destiny that she seems to be meant to carry out? Good question, I say. Excellent question. Clara asks herself that question all the time. I ask myself that question, too. I am waiting for a letter from the sky explaining it all. Hee hee. But one idea that I am fascinated by is C.S. Lewis’ concept of time. Mr. Lewis had trouble with this idea too, see, free will v. destiny, and he made it make sense in the following way: God does not operate in linear time. He does not experience event A followed by event B followed by event C. He experiences A, B, and C all at once. Therefore, he sees us making the choices we make simultaneously with the outcome of those choices. Did your brain explode yet? You can find his argument in Mere Christianity. It blows my mind. I wanted to play with it, but I also try to keep my books friendly to people of all religions and non-religious folk, so I don’t drag the theological elements into the plot of the book. I leave them ambiguous, which is true to how they are in real life too, right? Our brains had already exploded when we finished Hallowed, thank you. In your world, are visions absolute? That is, are they visions of one possible future, or will the vision come true no matter what occurs? Lol, see above. One thing I will say is that when Clara has a vision, it tends to come to pass in one way or another. With some slight variation, at times. We’re dying to know, although you may not be able to tell us: are the choices that Clara has made in Hallowed going to stay their course in the next book? If you’re asking me whether she’s going to be with Christian or Tucker, I shall stick my tongue out at you. Fair enough. *sigh* (We had to try.) You’ve hinted that there is the possibility that Clara’s story won’t end in the next book, and that we may see a fourth. True? Funny how the news can change so much in the space of a few months. I did have a fourth book planned. I worked on the third book all spring and summer with the idea that there would be a fourth book. But recently my editor has convinced me that the series should end in the third book, that I didn’t have quite enough there for a fourth book. I was bummed about this for a while, but it’s good news in a lot of ways. It means the third book will be the final book, L, but it also means that it will be a super-crazy-all-the-crap-hits-the-fan type of book. It’s going to be a whopper of a book, is what I’m saying. And as of right now, it starts out at the very end of the summer, right before Clara goes to Stanford. But that could change. . .
Are you working on anything future projects that you might be able to share with us? Right now I am working on Book 3, and after that I have a few back burner projects, but none that I can tell you about just yet! Join us again tomorrow when our interview with Cynthia Hand continues! She’ll share what she and Clara have in common, her most memorable fan interaction, and her hopes for the new television series based on Unearthly. Our sincere thanks to Cynthia for being such a great sport and patiently putting up with our many questions. 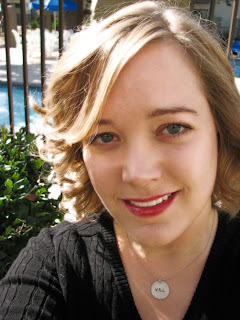 You can find her online on her blog, GoodReads, and Twitter. Go ahead and stalk her. We do. Excellent interview. I probably wouldn’t have ever even heard of this author (we’ll maybe but unintentionally) let alone read an interview if this wasn’t posted. Even though I haven’t ever read any of her books, I still found it interesting. Who knows if I ever come across one by accident, I just may now give it a go. Wow Wendy! This was an amazing interview. I’ve just spent the last four days reading Unearthly and Hallowed. Immediately after finishing Hallowed, I clicked over here to read your interview. I remember when you posted this but I wanted to stay away until I finished Hallowed. This was a wealth of information. I loved finding out how Cynthia came up with her angelology. All her answers were so well thought out. I also loved that you tried (albeit in a round about way)to find out if Clara was going to end up with Tucker or Christian! Nice try! Wish it would’ve worked! Now the wait begins for the last book. To be honest, I’m glad there’s only going to be three. I don’t think my heart could take waiting another year after the next one to see how this all turns out! Usually I do not learn post on blogs, but I wish to say that this write-up very pressured me to try and do so! Your writing style has been amazed me. Thank you, very great post. Great job with the interview – thanks for sharing! I love that quote, Jen, thanks so much for sharing that. It’s very clear from reading Cynthia’s books that has put quite a lot of thought and research into the angelology, but it’s still fascinating to hear her talk about it further. thanks for stopping by! Fun, fun, fun interview! I’m more excited than ever for the next installment. :) Love this, Wendy! Yay! Thanks so much, Sarah. :) I loved doing it. Andrea, Sagacity, Kate, Jade: get thee to a bookstore! Jen, after this book I keep bouncing back and forth between Team Tucker and Team Christian, and it’s making me dizzy! Amalia, I hope you loooove Hallowed as much as you did Unearthly. :) I loved it even more than the first book. Thanks so much, Bibliophile! It helps that the interview subject was so gracious and forthcoming. Juli–what did you think the big surprise was, out of curiosity? Canadian Girl, I really appreciate that the author discussed those subjects, too. Hope you get a chance to read Unearthly soon! Mimi, I did the same thing! It’s important to help support our favorite anyway, however we can. I also bought Unearthly for my niece for Christmas, hee hee. This interview really did blow my mind. Seriously. I think I may be in love with Cynthia w/o even reading her books. Dude. Amazing interview, Cynthia!! I already pre-ordered Hallowed even though I have an ARC LOL! x) So excited for book 3! I’m a new follower, new to the blogging world. But can’t wait to read your future posts. Well, I definitely need to start reading Unearthly, don’t I? Great interview! 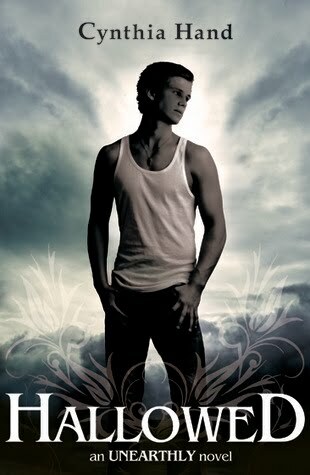 Apparently I need to read Unearthly ASAP because everyone seems to be raving about Hallowed. It’s so hard to find sequels that live up to your expectations but it sounds like Hallowed does that. I love how much thought Cynthia put into the question of free will vs. destiny because there’s such a rich mythology about angels. As creatures in a lot of religion, I think it’s important to explore that question because it’s a question that many of us think about. I LOVE the way you phrase your questions! You slip your reaction in there – very cool and it makes it feel like a conversation. I try to do that with mine on occasion, but it’s easy when the author gives such good answers, eh? Great post – I had Unearthly at one point, but the library needed back before I had a chance to read it – will have to request again! The idea and the anticipation of our next long, long Unearthly discussion fills me with longing, Wendy. We must not be saddened by it being our last Unearthly gathering, Ms. Hand has a long, successful career awaiting her, and she will provide us with more thoughtful conversations material, more books, more epicness. Our relationship with has barely began. This interview was absolutely to-die for! 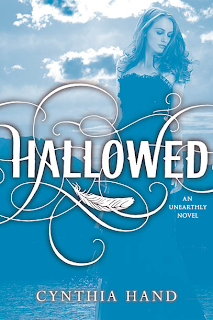 I love love love Unearthly and I’ve already ordered Hallowed online (can’t wait to read it!). Cynthia Hand is definitely my favourite author, hands down. Epic, indeed! I’ve yet to read Unearthly but after reading this interview,I just want to drop everything and read Cynthia’s books :) Wonderful interview! I loved the interview! I’m sad there won’t be a 4th book, but I think.. as long as everything is wrapped up in book 3.. then that will be absolutely fine as well! And I can’t wait to read the final conclusion in 2013. Great interview! I recently (finally) got a copy of Unearthly and am dying to read it so I know what everyone is talking about in Hallowed. Ah, the nice thing is that this book is actually worth the wait, S&C. :) Egalley or no, I’ve already pre-ordered my shiny hardback for my shelves as well! I’m so happy the interview added to your Hallowed reading experience, Heidi! I’ve been bursting to share this, it was so hard to wait until today to do it. Missie! Put everything down and go buy Unearthly now! I can’t believe you haven’t read it yet. I’m pretty sure you will enjoy, and that you’ll love Hallowed even more. KC, lucky you and me, to be living in two cities where we could, COULD, stalk Cynthia in person if we were so inclined. :D Hope you enjoy this sequel when you read it! Penny, I was thrilled that the author went into such detail about her influences and research as well. I agree, she did a great job of balancing the knowledge that prepared the narrative, but the religious content wasn’t pushed in our faces. Thank you so much, Sash (and Em) and The Nightmobile! I wouldn’t worry too much about the sadness, TNB, try to just enjoy reading the book and forget everything you’ve heard. I think you’ll still find it to be a beautiful and moving experience. I would totally love to read more about Samjeeza and Maggie! I didn’t read the spoilery bits, but great interview, Wendy. I am seriously dying to read this. Though I’m worried about all this sadness I keep hearing about! THIS IS AMAZING. It’s great to hear about all the research the author did for this book. I am such a big fan of Unearthly and I knew that even though she doesn’t push an obvious religious agenda, the writing showed a lot of depth that meant that the author had done her homework. Fantastic book and fantastic interview! Can’t wait for Hallowed! Spoiler Alert! Oh man, someone dies in book two? I suppose I should’ve read Hallowed already considering how much I loved Unearthly. I guess I’m glad to know that it is a sobfest so I can read it at the right time, emotionally-speaking. Thanks so much for the awesome interview! I was SO excited to see this because I just finished Unearthly a few days ago (LOVED IT!!!) and just found out Ms. Hand is coming here for a signing in a couple of weeks. Could not be more excited, and can’t wait to read Hallowed! If I came across a pregnant woman at the library who was crying, I’d totally freak out. That must have been quite a sight. But I love emotional reads, so that is why I’m kicking myself for not having read Unearthly yet. I tried to skip the spoilery stuff in the interview, but it is crazy to try to understand destiny and free will and what exactly it all means. There’s just so many possibilities. I have heard the Tucker is a cowboy, and of course, I love that little tidbit!! Can’t wait to meet him or to read the second half of the interview! Eeeeh, and since I can’t edit my comment, Wendy, let me fix it: I meant INTERVIEW not REVIEW. I’m not used to interviews, as you can see, hah. YAY! Can’t wait for Clara to go to Stanford! Oh, Cynthia Hand, how I love thee. Excellent review, Wendy! My mind is blown. I just finished reading Hallowed this afternoon, and reading such an insightful and in depth interview was a wonderful way to wrap things up! I’m excited to read part 2. Perfect! I am thrilled that this will be a trilogy and am more excited than ever for the release. I couldn’t cajole an ARC from netgalley either. No matter how many times I said please. Thanks so much for your comments, everyone! :) I was thrilled that she went into as much detail as she did, too, and her thoughtful answers just blew me away. And to those who haven’t had a chance to read Unearthly yet–goodness, what are you waiting for?! You’re in for a treat. OMG! I’ve just starded reading Unearthly 2 days ago, my goodness i usually feels like reading the book all through the night, its killing me. Am now in the part where Tucker breaks up with Clara. I really cant stand it. This is an amazing interview, and it makes me even more impatient for January 17th. I am so dying to read this book. Netgalley denied me repeatedly, The only title I can’t seem to get. Go figure. Ohh please tell me you will ask her about Idaho and Wyoming. I am kind of glad to hear the story will end in three. That usually is a good thing not to drag it out too long! I will stop by tomorrow. Fingers crossed for a giveaway! Great interview, Wendy! Looking forward to part two! Ok this clears up some of the questions I had about Hallowed! I kinda wish there was a fourth book, but maybe she can selfpublish Samjeeza’s story or something. Loved this interview! In a way, even though I LOVE (love, love, love!) this series, in a way I’m glad that it will be a trilogy (as first planned). Too many YA trilogies are being overstretched and they’re worse off for it. (that extra Hush, Hush book was a bad idea!) I’m looking forward to an epic finale for Clara and friends! Ohmigodohmigod. I am almost crying, I am dying to read Hallowed! I love this interview and I can’t wait to find out more!